This morning during my walk I noticed a slash of green which swayed with the wind. A blade of grass? But no, there he was, a very small lizard, as green as a shamrock and motionless except for his swaying tail. We watched each other for a moment, he with wary golden eyes and I with admiration. Then I went on with my walk and he returned to measuring the wind. The green lizard is one of many treasures to be found in a morning’s outing. Most of these are easily overlooked, like buttercups growing in a neighbor’s grass or one fragile star-shaped white flower, doubtless a weed but lovely anyway. Other marvels move so quickly that I can barely see them, a bluebird on wing, perhaps, or a yellow finch that flies by in a flash of gold. I’ve tried to capture these moments in haiku—not always successfully, I’m afraid. By no means am I expert or even adept at haiku, but I love this poetry form. At best, haiku has a spare elegance that relies on eye, mind and spirit to observe something, capture its essence, record it, and move on. Like an artist’s sketch that is swiftly done but which holds everything worthwhile, the haiku says little but tells all. While growing up, writing haiku was a game. The familiar 5-7-5 syllable count was easy to master, even for a child. Later, I learned that there were rules and season words, but even that didn’t take away from the enjoyment. I was hooked. A friend who is a haiku master has told me of retreats where poets gather to observe nature and write on a selected topic. This process must produce fine poetry and create an atmosphere for sharing and inspiration, but I have never tried it. My own efforts are ordinary and simple and are mostly about ordinary things. Like my green lizard, like raindrops on pine needles, like the swirl of monarch butterflies flying above while of their members lies, wings torn, on the sidewalk—the life force is full of movement, triumph, grief, joy and… frogs. Thanks for letting me join you on your spring walk. I love that a lizard, bird, and a frog made it into haikus, but I’m so sad for the butterfly. 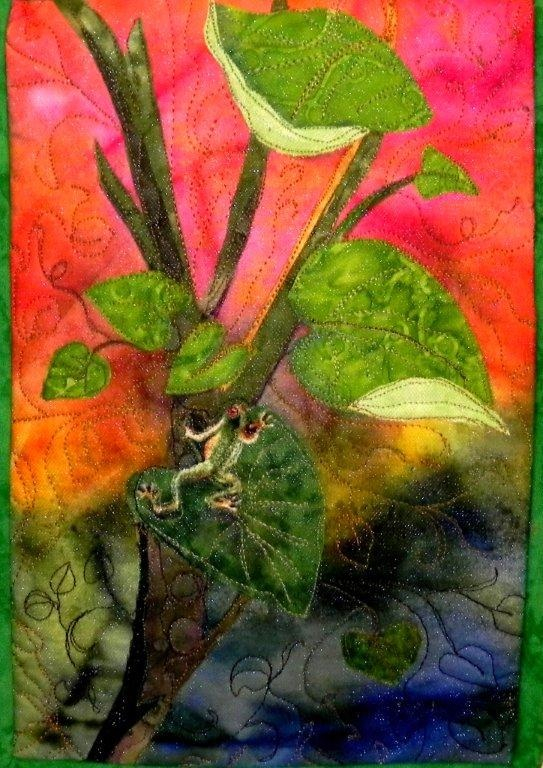 Your quilt art is fabulous! What a treat to visit your site. Thank you for joining me on the walk, Linda! Thanks, Linda! Today I am so excited because my white peony just bloomed. Hmm. I may have to write about that….